New Milford Cub Scout Pack 467 has made history by welcoming its first girl. Pack 467, chartered by St. John’s Episcopal Church in New Milford, applauded recently as Lilah Reguin, 8, was introduced at its pack meeting last Thursday. Lilah is the first female Cub Scout in the Northwest Hills district, the Connecticut Rivers Council and in the state, according to Robin L. Toni, director of marketing for the Boy Scouts of America Connecticut Rivers Council. The Boy Scouts — for the first time in its more than 100-year history — announced last year it would welcome girls to its Cub Scouting Program. Lilah’s older brother, Ian, is an Arrow of Light —the highest rank in the Cub Scout program — in Pack 467. Lilah flashed several smiles as she was introduced at the start of the meeting, and high-fived Amy VonCulin, senior district executive for the Northwest Hills, after VonCulin presented her with her Bear uniform. The new Cub Scout is in the Girl Scout program and plans to remain in that program while she simultaneously participates in the BSA family. “The pack meetings were already family-oriented, so the whole family, even extended family, would be invited along to do activities,” VonCulin said of one of the BSA new program’s benefits. “This is what family is all about - inclusiveness,” Toni said. Existing charter organizations may choose to establish a new girl pack, establish a pack that consists of girl dens and boy dens or remain an all-boy pack. Cub Scout dens will be single-gender — all boys or all girls. Using the same curriculum as the Boy Scouts program, the organization will also deliver a program for older girls, which will be announced later this year and is projected to be available in 2019, that will enable them to earn the Eagle Scout rank. 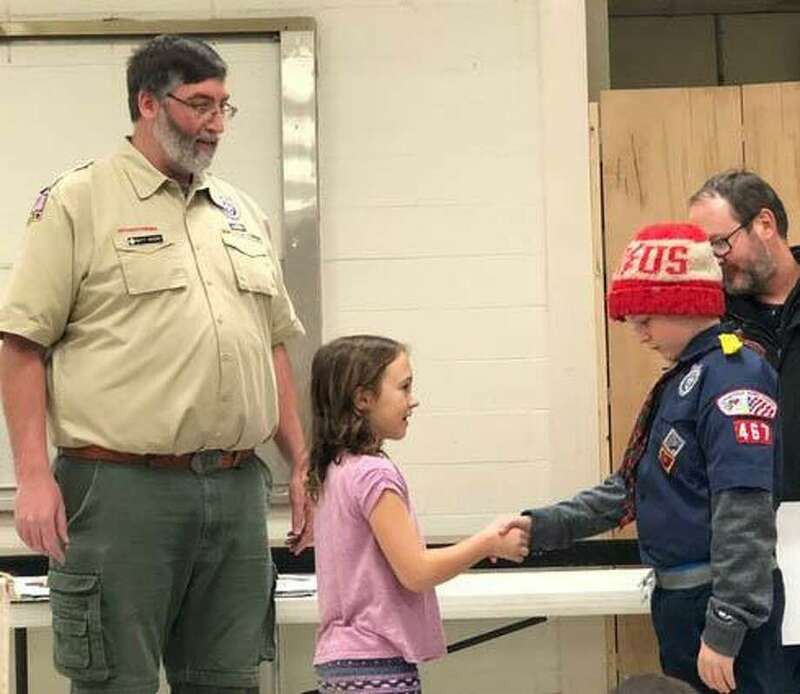 The Connecticut Rivers Council has permitted six packs in the district to pilot the Family Scouting soft rollout, but Pack 467 is the first one to receive membership from a girl. Lilah’s father, Matt Reguin, an assistant cubmaster with the pack, said Lilah has been “engaged” in the pack’s activities for years due to her brother’s involvement as a Scout. “She had a positive experience with her brother as a forerunner,” Reguin said of why Lilah decided to join. “It’ll be a positive exchange” and “both genders will benefit with the interaction with the other,” Reguin said. Cub Scout Pack 467 is looking for three other girls to join by Feb. 1. For more information about Pack 467, contact Higgins at 860-946-9684 or matt.higgins@pack467.net.